Southwest Breakfast Tacos! Tofu scramble with black beans, spinach, green chilis and crispy hash brown patties. Topped with salsa, avocado and cilantro. Vegan & Gluten-free. Now you can enjoy tacos at every meal! You are welcome. These Southwest breakfast tacos are what your brunch dreams are made of: eggy tofu scramble, hearty black beans and Dr. Praeger’s Southwest Hash Browns! If you’re not familiar with Dr. Praeger’s, I think you are really going to like their products. 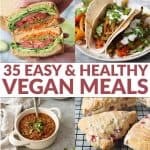 They create simple food with real ingredients that are good and good for you! No hard to pronounce or questionable ingredients here, exactly like I would make in my own kitchen! I’ve been eating their veggie burgers for years, so when they reached out to see if I wanted to try their newest line of hash browns, I was completely on board. I honestly don’t know who loved these tacos more, BL or myself. We both scarfed down the batch test, ate more after I photographed them, and then BL requested them for breakfast the next day. Just like the hashbrowns, these tacos are vegan and easily made gluten-free by swapping in corn for flour tortillas. Since I have no problem eating gluten, I kept the flour tortillas as they are my favorite, but make whatever adjustments you need to enjoy these tacos! 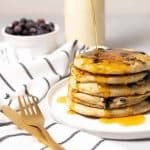 You’re going to want to eat them morning, noon and night. Great tacos rely on perfect timing — they must be assembled just before serving for the best results. That means piping hot tofu scramble, extra crispy hash browns and condiments ready for topping. To serve a table full of hangry brunch-ers, I prep the salsa, cilantro, avocado slices, hot sauce and anything else you want to add to these tacos ahead of time. Press the tofu, drain the beans and get the spinach out of the fridge. As soon as the Southwest hash browns go in the oven, start the tofu scramble. By the time the potatoes have finished cooking, you are ready to assemble the tacos. For extra adorableness on the table, I use these metal taco stand holders. They instantly make taco meals more fun, and no more spilled toppings! Vegan Southwest Breakfast Tacos! Scrambled tofu with green chilis, black beans and spinach. Topped with hash browns, salsa and avocado. Preheat oven to 450 degrees F. Place hash browns on ungreased baking pan. Bake for 5 minutes until browned. Carefully flip and bake an additional 4 minutes, until heated through and well browned. Remove from oven and set aside. While the hash browns are cooking, make the tofu scramble. Heat oil in a large skillet over medium heat. Add the onion and cook for 2-3 minutes until soft. Crumble the pressed tofu into bite-sized pieces and add to the skillet. Season with salt, pepper, garlic powder, cumin, chili powder and turmeric then saute for 3-4 minutes until slightly browned and warmed through. Add in the drained green chilis, black beans and spinach until spinach has wilted. Season to taste with salt and pepper, if desired. 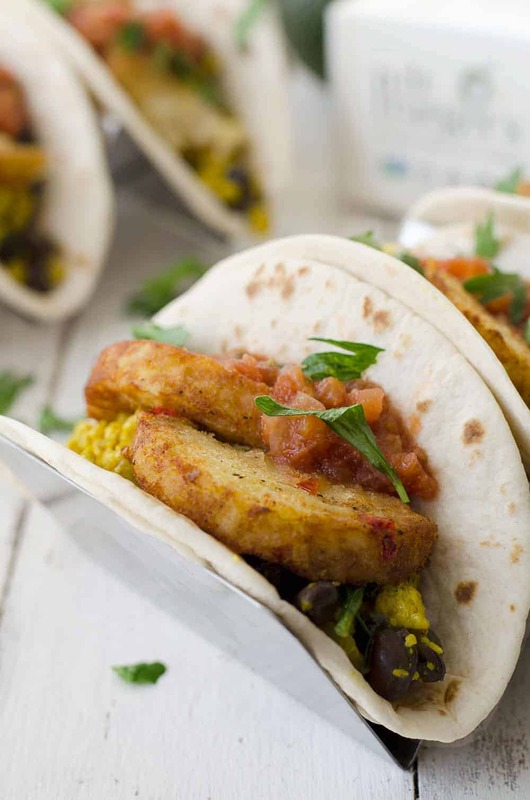 Divide the tofu scramble among the tortillas and top each taco with 1 hash brown patty. Top with salsa, chopped avocado, and hot sauce. *If you are new to tofu, refer to this post on how to prep tofu. Me too! One of my favorite veggie burgers. 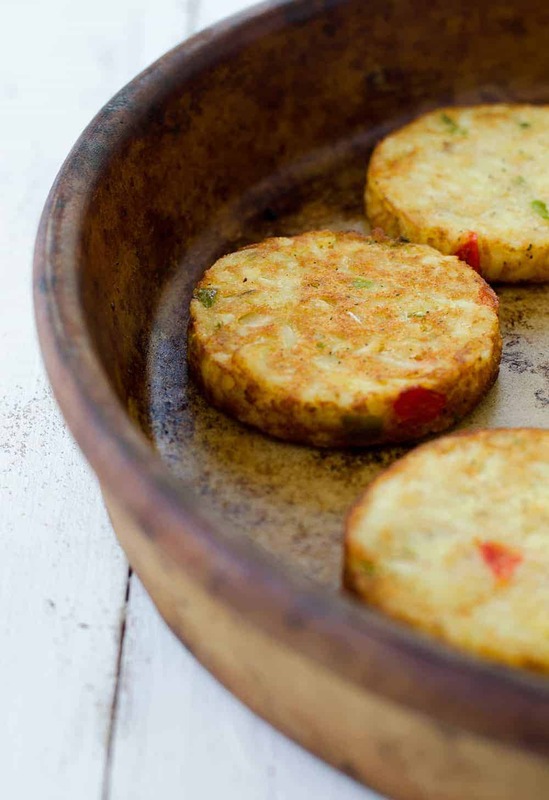 If you like those- you’ve gotta try these hash browns- they are amazing gluten-free! Yay for tacos at breakfast! 🙂 I’m going to track down those hashbrown patties and add this to my Cinco de Mayo menu! Thanks! They are SO delicious. They have other flavors as well!